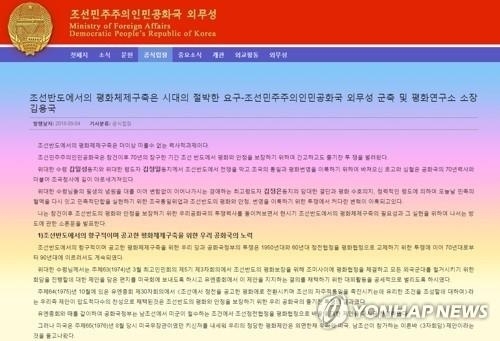 SEOUL, Sept. 5 (Yonhap) -- North Korea's Ministry of Foreign Affairs has called for a declaration to end the 1950-53 Korean War to build mutual trust with the United States and establish permanent peace on the Korean Peninsula. Kim Yong-kuk, chief of the Institute of Disarmament and Peace affiliated with the ministry, said in an essay posted on the ministry's website Tuesday that a declaration of an end to the war can be easily realized simply through the political will of the concerned countries. The essay was posted ahead of the Pyongyang visit by South Korea's presidential envoy. It apparently sought to provide the theory and logic for Pyongyang's consistent call for an end-of-war declaration before its denuclearization process. "Signing of a peace treaty will require time, because the chasms of hostility and contradiction are too deep and piles of difficult problems lie ahead. It is reasonable for the countries concerned to adopt a declaration to end the war, which can be always possible if they have any political will," Kim said in the essay. The Rodong Sinmun, the organ of the ruling Workers' Party, said in a similar commentary on Aug. 18 that an end-of-war declaration is a mere political declaration, raising speculation that the North's regime was attempting to lower the weight of a declaration of an end to the war to attract a response from the U.S.
Kim went on to accuse the U.S. of having caused the present nuclear problem of the Korean Peninsula by pursuing a policy of hostility and isolation and economic sanctions towards the North. "The reality is that an improvement of the North-U.S. relations and denuclearization can hardly be achieved without building a lasting and solid peace regime on the peninsula," he said. He then urged Washington to respond to Pyongyang's "faithful efforts" made at this year's inter-Korean and North-U.S. summit talks.